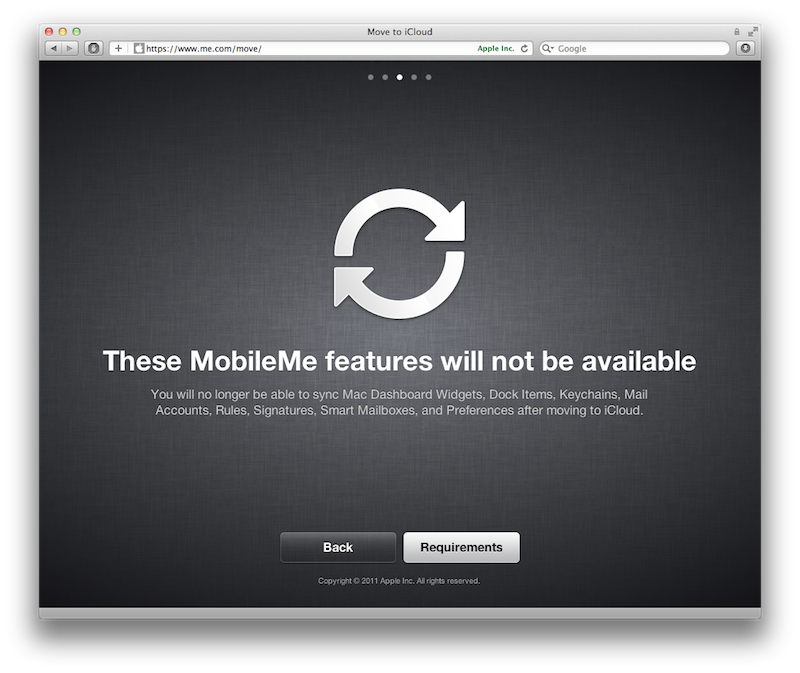 While many of the features of MobileMe are simply being upgraded in the move to iCloud, Apple has previously noted that Gallery, iDisk and iWeb are on the chopping block. Now, the company has further made it clear that data sync features will also be canceled in its iCloud transition steps. A key feature of .Mac and later MobileMe was the cloud integration of iSync, Apple's Mac-centric tool for keeping data in sync among a variety of devices as part of its "digital hub strategy" first unveiled a decade ago. The data sync of .Mac and subsequently MobileMe moved the "truth database" from the user's Mac into the cloud, making it possible to sync additional types of data between Macs. MobileMe currently allows a user to sync a variety of settings between Macs, including the layout of Dashboard widgets, Dock items, passwords and credentials saved in the Keychain, email account information including Mail Rules, Signatures and Smart Mailboxes, and System Preferences. However, all of these features will terminate as soon as a user migrates from MobileMe to the new iCloud, according to Apple's transition pages at me.com/move. 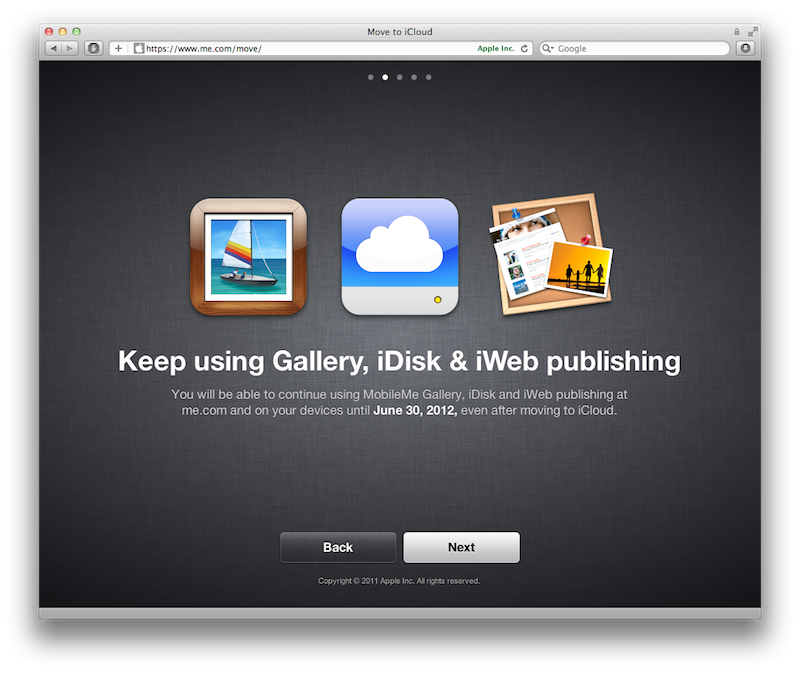 Other MobileMe features that are not being carried forward into iCloud, including Gallery media hosting, iDisk cloud storage and its integrated iWeb web hosting, will be continued for exiting MobileMe subscribers until June 30 of next year, even after migrating other data to iCloud. These features are easy to maintain independently from iCloud, because there is no direct equivalent in iCloud. Gallery media hosting is being dramatically rethought as Photo Stream, a push updating feature that presents a user's photos on the mobile devices, Mac photo albums, and on Apple TV rather than via a web site. Similarly, iDisk is making way for an entirely new type of document and data updating that focuses on a users' own hardware rather than web-centric hosting. 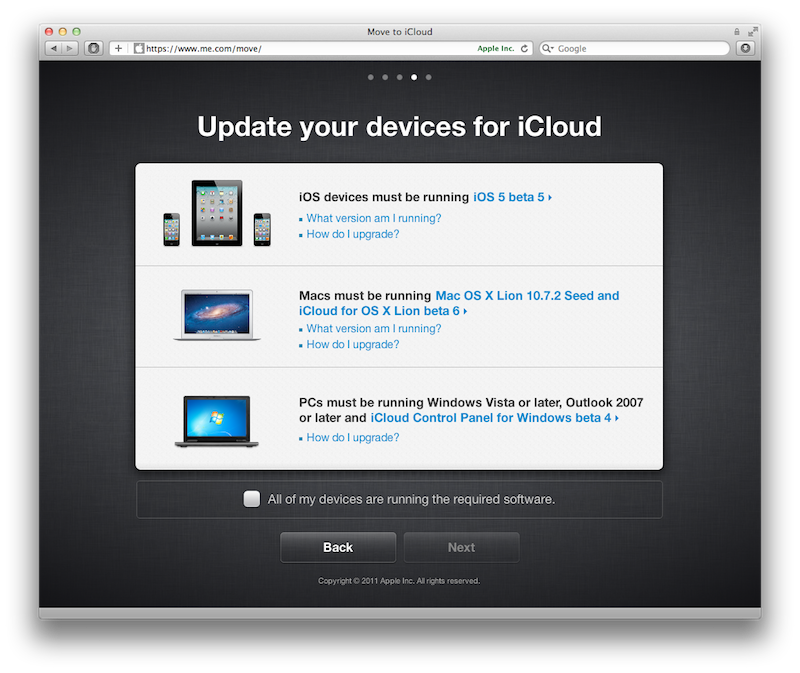 The iCloud migration process is currently only open to developers, as it requires users to have iOS 5 beta 5 on their mobile devices, Mac OS X Lion 10.7.2 with the iCloud for Os X Lion beta 6 package on their Macs, and the iCloud Control Panel for Windows beta 4 running on any PCs they use. Apple's discontinuation of data sync in iCloud is curious, particularly for Keychains and System Preferences, although the company may have plans to delegate such features to third party app developers. Mail accounts have been overhauled enough in Mac OS X Lion that a continuation into iCloud might involve too much additional work; mail accounts are now being presented differently in Lion, which integrates external accounts across "Mail and Notes," "Calendar and Reminders," Chat and Contacts apps, rather than simply associating email account information with Mail. 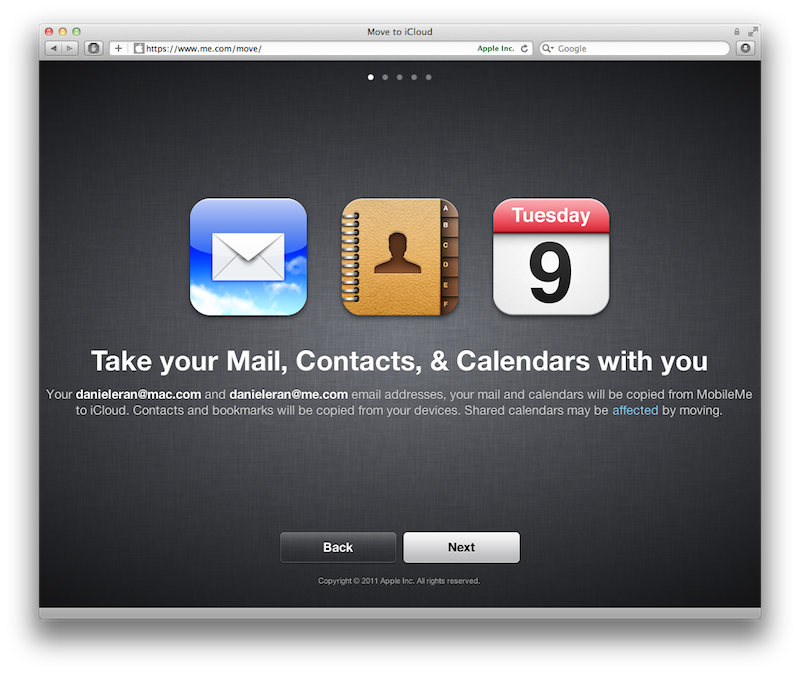 Similarly, Dock items are now expanded into Lion's new Launchpad feature, which could make it problematic to sync Mac OS X Lion items with other Macs running previous versions of Mac OS X.
Apple notes that while Mail, Contacts and Calendars can be migrated from MobileMe to iCloud, shared calendars may be affected in the move, while Bookmarks will simply be imported from a client system. This indicates the reduction in data supported in the transition to iCloud may largely be explained by Apple's hopes to keep the migration as simple and problem-free as possible, avoiding the issues users had in the move from .Mac to MobileMe. Another reason for the shift in features between MobileMe and iCloud may be explained by the underlying security changes that differentiate the wide open iDisk from the carefully sandboxed design of iCloud's Documents & Data. Currently, data synced to MobileMe by Mac OS X Sync Services is copied into openly accessible folders. It is likely Apple hopes to completely secure all iCloud data to avoid any embarrassing lapses and contain sensitive data from potential malware attacks. Individual apps, such as Keychain Access, Launchpad and System Preferences, may be modified in the future to take advantage of iCloud's key value data store, duplicating the old MobileMe features in a more secure fashion.